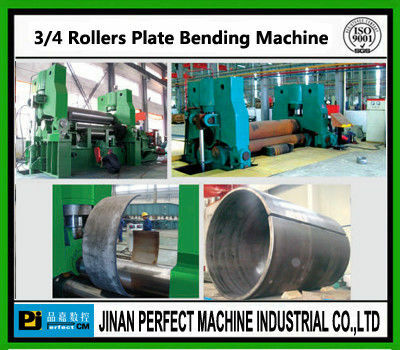 Three Rollers Bending Machine is mainly used for bending plate sheet metals, can be processed plate sheet into a variety of workpieces with Cylindrical, arcs, and a range of Cylindrical cone shape. The machine's two bottom rollers are driving rollers, the rotation is achieved by the motor driven reducer rotation; Top roller is driven roller, the rotation is achieved by the drive of friction between plate and every rollers. Through friction movement of bottom rollers to achieve rolling, when discharging, overturned device manually controls overturned and erected. Top roller's lifting and two bottom rollers rotation are mechanically driven. Shaft nose of the Rollers two ends is SF-2 composite sliding bearing. The bending machine's electrical system is centralized controlled, its structure is simple, reliable, compact, light weight, smooth operation, low noise, and it is very convenient to process workpieces. The machine is composed of working unit, the main transmission unit, top roller’s lifting unit, electrical control unit and others.Should Your Excellency need more information for other Models, please send us your inquiry.